With Thanksgiving?coming up next Thursday, I thought I’d do one more blog post this week since I won’t be posting during the holiday week. Ever since we started the wood stoves going back in October, we can always count on finding Tanner laying down in front of the one in the living room every evening. 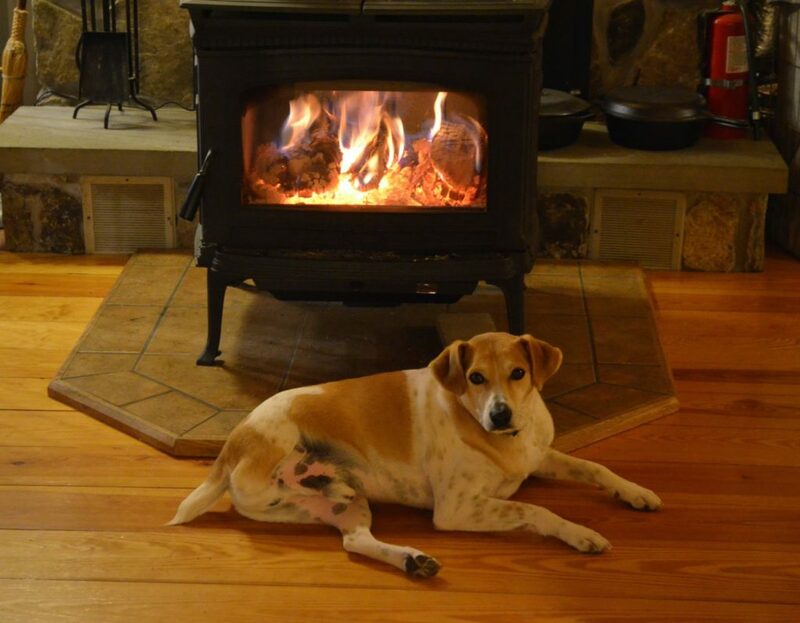 Tanner just loves the heat the wood stove throws off and can’t seem to get enough of it. We?joke that this handsome boy is actually trying to get noticed for a modeling gig with Orvis, the outdoor clothing and gear retailer that often features dogs in their catalog photos. We’ve started calling him “Orvis” at moments like this in front of the wood stove. With his bird-dog heritage — we think he’s got a lot of Brittany spaniel in him — he’d be a natural fit. Tanner is one of those dogs who is also a natural in front of the camera — always drop-dead gorgeous and, as we pointed out in an earlier post, something of a camera hog anyway. First thing every morning now, when Darla is ready to go charging out into the brisk fall weather, Tanner stays curled up on his bed in the corner of the living room, hoping we’ll throw another log or two in the stove and get the fire roaring again. We hope all of you here in the US have a wonderful Thanksgiving holiday next week. I’ll resume posting on Monday, November 30th. Happy Thanksgiving to all the occupants of Rolling Dog Farm! Love you all and you are so appreciated! WHAT A BEAUTIFUL PICTURE – NICE WAY TO SPEND YOUR DAY TANNER. Have a wonderful Thanksgiving. We give thanks for YOU! What a perfect photo with Tanner. I know there are other categories to the Shelter Challenge. Are any photos? This would certainly be a terrific entry. I’m sure this was spontaneous but it couldn’t be better if it was posed. He’s such a show-off. Wishing everyone at Rolling Dog and all the other blog readers a blessed Thanksgiving. We all have so much for which to be thankful. We are thankful for you and Alayne and all the loving care you give these wonderful creatures. We hope you have a wonderful holiday with all you pups and horses. We are thankful to enjoy Travis/Orvis from afar, Darla’s clean spleen and healing, and so many wonderful things you have accomplished at Rolling Dog Farm. All the best, and many blessing to you all. Happy Thanksgiving! I’d enjoy nothing better than seeing Travis on the cover of the Orvis catalog! You should TOTALLY send his photo to Orvis and tell them his story…..it would be great for them to feature a tripod dog! Yes, you should definitely put together a portfolio for Tanner. That’s a great photo, and he’s such a handsome guy. Orvis would love to feature him, I’m sure. Here’s a link for Orvis’ Cover Dog contest, which runs from 1.October 2015-31.March 2016. This contest raises funds for cancer research. It could be Tanner’s ticket to fame, Milk Bones and his own wood-burning stove.